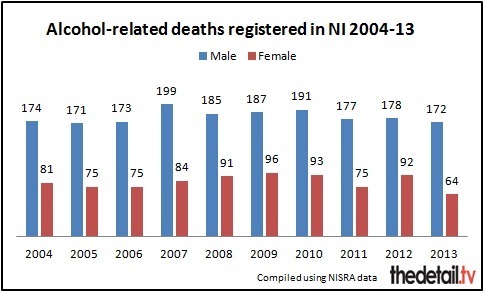 OVER 2,630 people died from an alcohol-related death in Northern Ireland in the last 10 years. The deaths include people who died from chronic liver disease and cirrhosis, and poisoning with alcohol. Significantly, causes of death that are indirectly related to alcohol are excluded from the figures. The total deaths directly related to alcohol are almost triple the number of deaths in road traffic collisions across Northern Ireland (962) over the same 10 year period. The massive death toll from drink has emerged after The Detail examined Northern Ireland Statistics and Research Agency figures and collated the 2,633 deaths registered from 2004 to 2013 which directly relate to alcohol consumption. 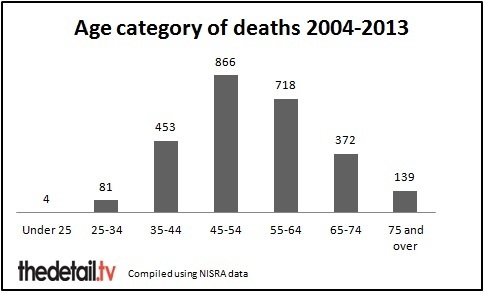 The NISRA data shows that in 2013 alone 236 people in Northern Ireland were registered as dying from an alcohol-related death – 172 men and 64 women. Over the 10 years we examined, 69% of the deaths were male. The Department of Health has previously confirmed that alcohol misuse costs Northern Ireland up to £900 million every year – including £30 million spent on emergency department attendances. From 2004-2013, there were four alcohol-related deaths registered in the under 25 age category, compared to 866 deaths registered among 45-54 year olds. Gary Doherty, Impact of Alcohol Manager at the Belfast Health and Social Care Trust, said that while the death statistics show alcohol misuse is a major issue, the true extent of its negative impact was not visible through the figures. He said: “The death rates exclusively deal with alcohol, but they do not cover deaths as a result of road accidents and crime. Alcohol impacts on society in so many ways that aren’t measured. Mr Doherty continued: “The British Liver Trust has said that in the past ten years liver disease in young people has drastically increased. This is because they are drinking a lot younger and this is because the drinking of alcohol has been accepted in our society. “You can quote all of the statistics but you can’t measure the impact that alcohol has on an individual, on a family and on a community. “Binge drinking is nothing new in our society. However, if you were to ask people to complete an online questionnaire, you could be quite frightened. If you were to drink a bottle of wine with a meal, then that is an episode of binge drinking. Mr Doherty said that one of the key issues being looked at is the pricing of alcohol. “The government are considering putting the price up, and that is a key indicator that they are trying to tackle the issue. Scotland have had success with this tactic, and research says that it could improve matters but this policy is being driven by alcohol companies. In extreme cases, alcohol dependency can push people to the edge of death. 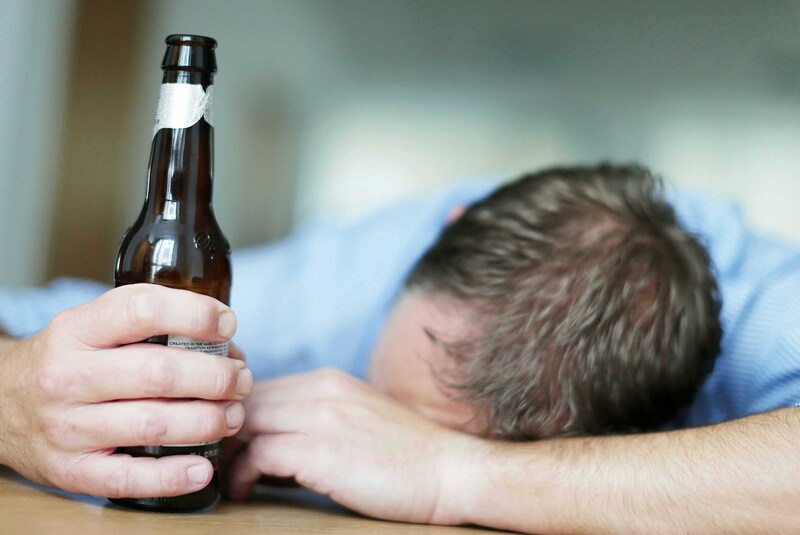 The Detail has spoken to a 32-year-old Co Antrim man about his battle with alcoholism. He asked not to be identified, so in this piece we will call him ‘Robert’. Robert’s words paint a horrifying picture of his alcoholism which led to near-fatal cirrhosis of the liver. He continued: “The first night I started drinking was at a party when I was 15. My friends were drinking and I decided to as well. I realised that night that alcohol gave you confidence that sobriety didn’t. Robert admitted that his dependency was at its worst after leaving his job, but the year and a half prior to this had also been a struggle as he started to feel the psychological effects of alcohol abuse. “I suffered from what I believe was depression and bad anxiety brought on by daily alcohol consumption. It had reached the point where I couldn’t go out or face anyone without a drink. I hid away in work as much as possible. “I was drinking in my mate’s shed, normally alone, as soon as I finished work. After quitting his job in 2007, Robert’s habit progressed to constant daytime drinking. He had friends who were keen drinkers and saw no problem with having a drink at 9am or going to the local pub at lunch time. “Not long after I had quit my job, a friend phoned me to tell me that he had just passed his driving test. Even during his first withdrawal seizure, the first warning sign that he had a problem, Robert refused to label himself as an alcoholic. His turning point began when he was faced with some startling side-effects to his alcohol dependency, both physical and psychological. On top of depression and anxiety, which he had once tried to combat with alcohol before realising this was the root cause, he experienced disturbing hallucinations. However, it was the physical effects that eventually led him to seek treatment in 2010. Over time, Robert had developed a symptom known as ‘ascites’, a build-up of fluid in the abdomen which marks a particular serious case of cirrhosis of the liver. As a result of this, Robert signed himself into the Mater Hospital in Belfast, where he received treatment for his dependency. He now has what medical professionals would describe as ‘mild cirrhosis of the liver’ and his liver function has almost returned to normal. He has been told that he should never drink alcohol again. Robert said his condition, which was previously extremely rare in young people, is now becoming increasingly prevalent. “The way things are going, the number of young people with liver disease is just going to increase," he said. He concluded: “I would advise everyone, particularly young people to think about what they’re doing. They’ll realise in later life that necking shots and taking part in drinking games isn’t remotely funny. “By downing as much as they possibly can a night they’re playing roulette with their livers, bodies and ultimately their lives." There were 15,701 admissions to hospitals for drug and alcohol misuse in the financial year 2012/13 across all of Northern Ireland’s Health and Social Care Trusts, according to statistics released by the Health Minister in response to a recent written Assembly question. Mr Poots said: “Substance misuse has a clear and undeniable impact on this country and on the health service. “Research has shown that alcohol misuse alone costs Northern Ireland up to £900 million every year, and if we factor in drug misuse, the costs would total more than £1 billion. £250 million of these costs are borne by the health and social care sector. In a breakdown of alcohol-related costs to the health service, Minister Poots said that the cost for emergency department attendances was estimated at up to £30 million per year, the associated ambulance journeys are estimated to cost up to £13 million per year and the cost to the Fire Service is almost £0.5 million per year. A major incident was declared outside the Odyssey Arena in Belfast in February when 108 people who had purchased tickets for a concert required medical attention for alcohol misuse. Following this incident, Mr Poots said that changing the “pocket money prices” to reduce alcohol’s availability should be the first step in tackling the problem of binge drinking as a whole. In a statement issued to The Detail he said: “Drug misuse often gains more public attention but alcohol – our drug of choice – kills up to three times as many people here every year and leads to many more admissions to hospital. “I believe that Minimum Unit Pricing is potentially a targeted way of making sure strong alcohol products are sold at a reasonable price. It targets the strongest cheapest drinks, and these are often the products that cause most harm. “I believe the introduction of Minimum Unit Pricing may help to signal that alcohol is not just an ordinary commodity and that it should not be sold as a loss leader or treated like bread or milk. The government advises that men should not drink more than 3-4 units of alcohol each day and women should not exceed 2-3 units of alcohol. Binge drinking is more than 10 units each day for men – equivalent to roughly four pints of beer – and 7 units or more for women daily. Results from the fifth Adult Drinking Patterns Survey were published by the Department of Health this week. The survey was conducted In October and November of 2013 across a sample of private households in Northern Ireland. The key findings include that almost three-quarters of respondents (73%) drank alcohol. Younger adults (18-29 years) were more likely to drink than older adults (60-75 years) – 82% compared with 58%. Almost a third of those respondents (31%) who drank in the week before the survey had engaged in at least one binge drinking session with males (35%) more likely to do so than females (27%). Three-fifths of respondents (60%) were in favour of minimum unit pricing. However, only 4% stated that they would drink a lot less if a minimum unit price for alcohol was set at 40p, compared with 17% at 70p per unit. Joe Hyland is manager of the SOS Bus, a charitable organisation which provides assistance to individuals at night on the streets of Belfast. He said: “It is the function of young people to test their elders, and they are naïve. But it has always been the responsibility of older people to be there to keep them right. Addiction NI provides support and treatment for people affected by alcohol or drug addiction. It can be contacted on (028) 90664434. Alcoholics Anonymous’ national helpline is 0845 769 7555. Each of the Northern Ireland Drug and Alcohol Coordination Teams has produced a directory of services available in their area. Click here.